This stunning new villa is situated in the south of the island overlooking the inlet to Mongonissi. A short 5 minute walk from the villa brings you to Mongonissi with its sandy beach and an excellent taverna, the ideal place for dinner or to relax with drinks at sunset. 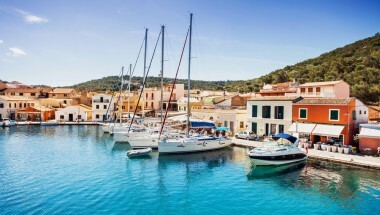 The main town of Gaios is just a short drive away with its bustling harbour, cafés, bars, restaurants, shops and supermarkets. Set in extensive grounds the villa offers both a high standard of accommodation and total privacy. 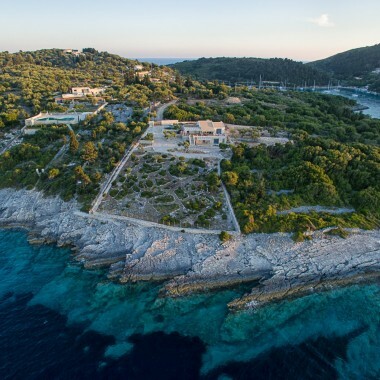 It is built entirely of local stone with accommodation on two levels, with panoramic views of Antipaxos and the Epirus Mountains on the Greek Mainland. The large pebbled garden with colourful flowers and shrubs, and olive trees offering shade, is the perfect place to sit and read a book or simply listen to the tranquil blue waters of the Ionian lapping onto the rocky shoreline below. There is also a large outdoor jacuzzi (3 x 3m) available from summer 2018. The property has three spacious bedrooms, one twin and two double, all with wooden vaulted ceilings, en-suite shower rooms and access to the large terrace through patio doors. The open-plan living space has a comfortable seating area with access to the outside dining terrace through glass sliding doors. The large kitchen is fully equipped with modern appliances including a centre island breakfast bar. Amenities include Wi-fi and air conditioning. 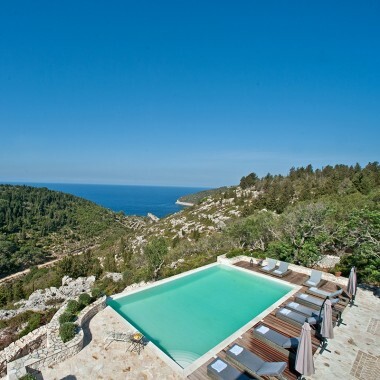 This beautiful villa to rent on Paxos is situated in the south of the island overlooking the inlet to Mongonissi. It is just a 5 minute walk from the villa to Mongonissi with its sandy beach and an excellent taverna, perfect for drinks at sunset and dinner. 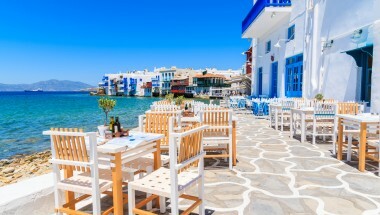 The main town of Gaios is just a short drive away with its cafés, bars, restaurants and shops.